There are lots of reasons. Trout in lakes are often larger than trout in streams. Most public lakes and reservoirs in Oregon that are accessible by vehicle are stocked with catchable trout several times every year, meaning that you can keep some to eat. Lakes come in a variety of sizes and personalities. Many lakes offer serenity that few other places can. "The setting for the development of ice cover in lakes is the annual evolution of the temperature structure of lake water. In most lakes during the summer, a layer of warm water of lower density lies above colder water below. In late summer, as air temperatures fall, this top layer begins to cool. After it has cooled and has reached the same density as the water below, the water column becomes isothermal (i.e., there is a uniform temperature at all depths). With further cooling, the top water becomes even denser and plunges, mixing with the water below, so that the lake continues to be isothermal but at ever colder temperatures. This process continues until the temperature drops to that of the maximum density of water (about 4° C, or 39° F). The scenario changes as water warms during the spring months. Ice normally starts to melt around the edge of a lake first as the earth around the lake warms faster than the water. As the ice barrier is removed from the surface of the water, the exposed water warms from direct contact of sunlight and air. Often shallow coves are the first place where trout collect to feed, then gradually the whole shoreline is free from ice. Insect life in this shallow water begins to move about and attract more and more fish. Gradually the lake will assume it summer stratification of water temperatures, and fish and the organisms will move accordingly. The whole biomass will gradually move from shallow to deep and seek the perfect temperatures. Using water temperatures to find trout. Trout have temperature comfort zones just like all other creatures. For humans who are awake, the perfect temperature is around 70 to 75 degrees. For trout, water temperatures of 50 to 60 degrees are the most comfortable. In a lake, if you find water in the 50-60 degree temperature range, you will find most of the trout. 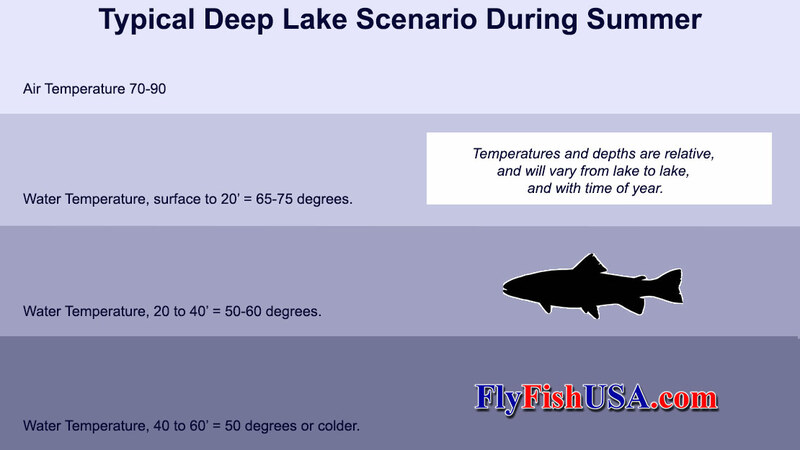 In lakes, temperatures often change with water depth. This illustration originated with Scientific Anglers during the 1980's. It shows how different densities of fly lines might be advantageous when fish are holding at different depths. Put your flies where the fish are. 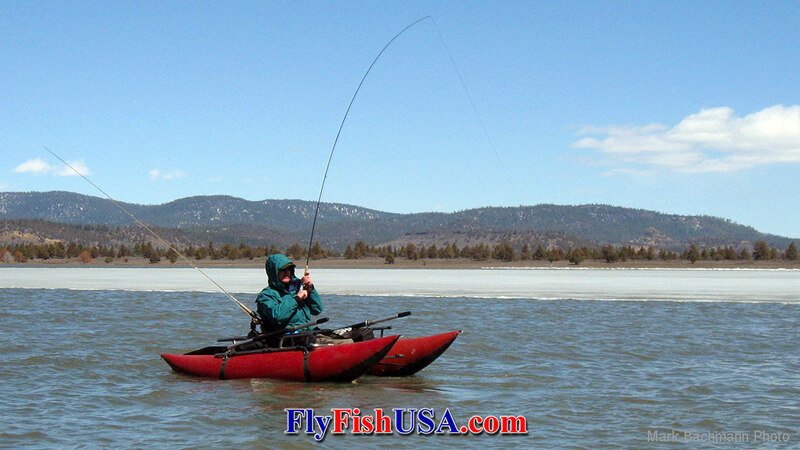 Much fly fishing in lakes is done with sinking lines. That doesn't mean that floating fly lines are unimportant, far from it. It just means that sinking lines are important more of the time. 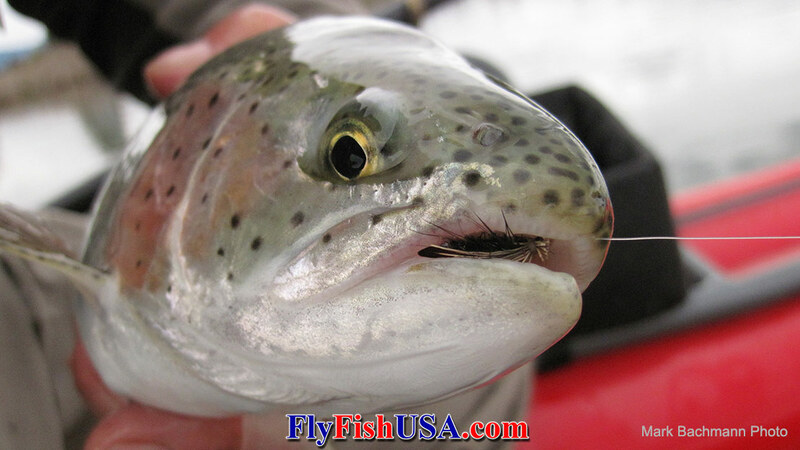 Trout in lakes have the option of feeding at the surface and/or at depths of many feet. In most lakes, when the surface water is too warm or too cold for trout comfort, the largest fish may seek deeper water where temperatures are more to their liking. Most trout, such as rainbows, cutthroats and brown trout, seek water temperatures from 50-60 degrees. Chars such as brook trout, bull trout, and lake trout, often seek water that is slightly colder: 40-50 degrees. Perfect surface temperatures in North American lakes usually exist during spring and fall months. Peak surface temperatures during mid-summer might rise to over 70 degrees, and then freeze during winter. In deep lakes or reservoirs, trout may migrate from the near-surface at certain times of the year, and be very deep at others. 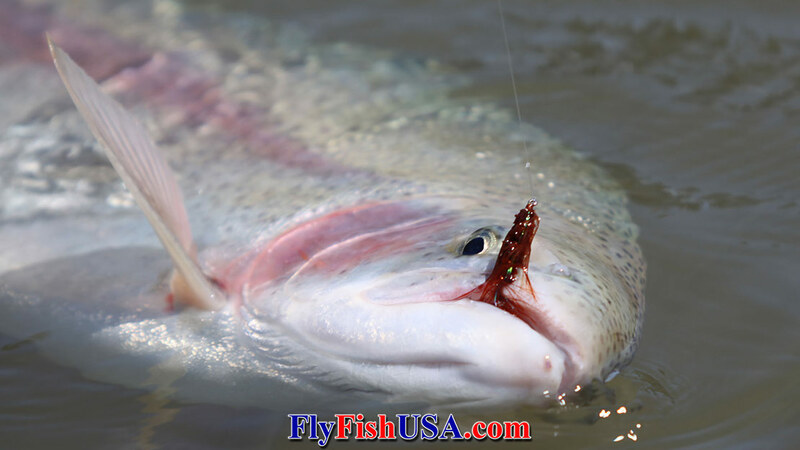 During times of hot air temperatures, you may need to fish your fly down to depths of over thirty feet. The good news is that there are fly lines that will do that easily. But when fish are much deeper than that, fly fishing becomes fairly impractical unless you can cast very long distances, or are willing to slowly troll your fly. Your primary fly line will always be a floating line. By varying your technique, leader length, and the weight of your fly, you will be able to fish from the surface to several feet deep. For instance, when you are fishing a weighted nymph such as a midge pupa under a strike indicator, you might be able to fish as much as twenty feet deep. But if you are fishing flies that need to be retrieved to impart action, then every time you strip your line, a floating line will pull your fly toward the surface. It is better to use a sinking line that will allow you to retrieve your fly level, or have it stay at the right depth to follow the terrain. If you are fishing from a boat and toward the shallower water near shore, it is often better to use a sinking line and a retrieve speed that will allow your fly to descend into deeper water as it comes toward where you are stationed over that deeper water. 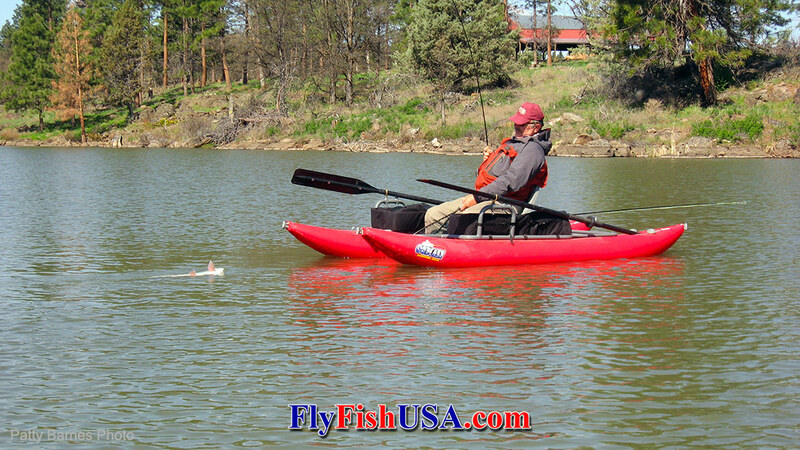 If you are stationed in shallow water, and are fishing into deeper water, then let the fly sink to within a couple feet of the bottom, then retrieve fast enough to to have the fly ascend as it comes toward you. Always experiment with keeping your fly following the contour of the bottom for as long as possible. That is because most of the things that trout feed upon are in the bottom of the lake. In weedy lakes, there is also a lot of fish food living in the weeds. As in fishing nymphs in flowing water, being able to fish your fly precisely takes knowledge and training. Given the chance, trout and all of the things they feed on, will stay out of sight as much as they can. 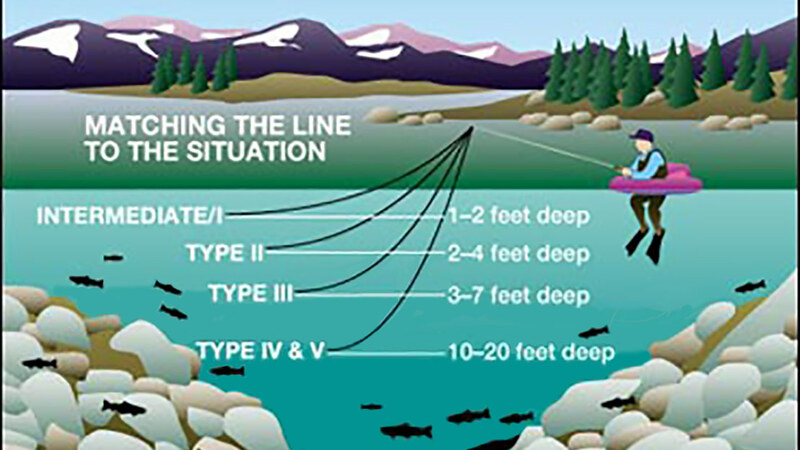 Many fly fishers who specialize in lake fishing use a multi-line system. Normally the second line is a clear-camo intermediate density line that is just slightly heavier than water. These lines have a sink rate of 1"-2". This line allows a slow retrieve that will mimic natural insects with unweighted flies. Make a few short casts and watch your fly sink to gauge the actual sink rate. If you count ten seconds and see that your fly is about 18" deep, then you have a sink rate that is about 1.5" per second. Make your longer cast, and then count seconds. A count of ten will still mean that your fly is about 18" deep. If you count your fly down for thirty seconds, then your fly is probably four to five feet deep. Weighted flies will add to a line's sink rate. So adding a weighted fly will either fish your fly deeper, or demand a faster retrieve. Building your complete Lake Line System. If you are consistently finding fish at fifteen or twenty feet deep, you may not wish to wait four minutes for your fly to get into the fishing zone. Adding a faster sinking, higher density line to your system is an obvious answer. The third line in your system is normally a type-3 (Deep-3) with a sink rate of 3-inches per second. This line will get your fly to depth in half the time as the clear-camo intermediate line. If you feel that you are still wasting to much time for your fly to get deep enough, you might consider adding an even denser line, such as a Deep-5, Deep-6, or Deep-7. Or you might consider adding all three lines for a complete set. Considering rods, reels and lines as fishing systems. Becoming a master at fly fishing lakes has some huge advantages for larger trout. Fishing lakes is a good plan for the casual fly fisher and also for the angler who needs to meet challenges for big rewards as well. Doing anything well demands dedication, and the right tools. It is hard to fish lakes without some kind of boat. From my perspective, it is hard to beat a single person pontoon boat for covering most lakes effectively. My next choice would be a float tube. Any floating device that you can power with your feet leaving your hands free to fish is good. Row boats and powerboats work well if the air is calm, or if they are anchored. When it comes to any kind of fishing boats, simple is best. As we have learned, being a successful lake fisher is easier when you have a full set of lines to fish efficiently at many depths. Each line will demand its own reel spool. There are many fine reels out there for lake fishing. The average size trout that live in lakes are from one to ten pounds. One to three pounders are most common. Anglers handle steelhead, which are larger and more dynamic fish than most trout that live in lakes, with click/pawl reels. So a heavy drag system is not a requirement in a lake reel. But a reel that is totally dependable and smooth running is ideal. If you are going to invest in building a system, you will want it to last. Figure that you may want to add a spool ten years into the future. Or even that your grandkids might want to add a spool forty years from now. The best example of a reel that fits this principle is the recently renovated Hardy Marquis LWT Series #6. Reels made in the early 1970's will interchange with the current models. The Marquis reels being made now in UK, are the best Marquis ever made. If you constantly improve something for 45 years, it gets pretty refined. Most dedicated lake fishers carry two rods that are rigged. Each will be set up to fish at a specific depth or for a specific purpose. The rods may be identical. That would be handy if you are interested in refining your feel for different fly lines. For two outfits, you will need two reels and possibly several spools. When it comes to reels and spools, it pays if everything is interchangeable. When Patty and I travel, we like to have all the reels and spools interchange. Tony, Frank and I got in a huddle the other day and decided that if we only owned one complete set-up for Oregon lakes (heaven forbid), it would be built around the aforementioned Hardy Marquis LWT Series #6 reel and two identical fast action, five weight rods. We were in universal agreement on our picks. All of these rods have similar fast actions. In order of preference: Sage 591-4X, TFO Axiom II, Beulah Platinum 590, Sage Foundation 590-4, Beulah Guide II 590, TFO BVK 590-4, Echo Base 590-4. With fall steelhead and salmon runs in the local watershed expected to be smaller than usual, this might be the year to explore lake fishing.